LEXINGTON, Ky. (Dec. 7, 2018) — ‘Tis the season to be jolly, don holiday apparel and share yuletide treasure. It is also a season for thieves to follow you, and it has nothing to do with merry measure. University of Kentucky Police Department wants all members of our community to heed the following safety tips when trolling the ancient yuletide carol this holiday season. Shop during daylight hours whenever possible. Avoid parking next to vans or cars with tinted windows. Park in a well-lit area and remember exactly where you parked. Secure all windows, hide valuables from plain sight, and always lock your vehicle. Refrain from texting or talking on the phone and from using ear buds or headphones. Stay alert and be aware of what's going on around you. Observe who may be watching you. Avoid wearing expensive jewelry or carrying large amounts of cash. Be very careful when carrying a wallet or purse. Carry a purse close to your body and a wallet inside your coat or front pants pocket. Beware of strangers approaching you for any reason. Con artists and pickpockets may try to distract you and steal your belongings. Have your key in hand when walking to your vehicle. Do not put your purse or shopping bags down to open the door. Once inside your vehicle, lock the door and leave immediately. Lock all doors and ensure gifts cannot be seen through windows or doors. Be aware that criminals sometimes pose as couriers delivering gifts or go door-to-door to solicit donations under the guise of charitable causes although no charity is involved. Criminals can also work in teams — while one distracts you at the front door, another enters your residence via a back door to steal. When decorating your home, ensure your tree is secured properly to a sturdy base. 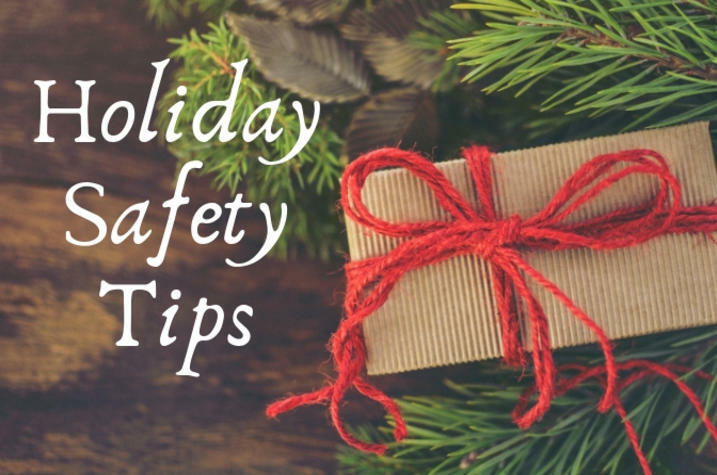 Use flame-resistant ornaments and do not leave lights on overnight. Double-check you have locked all doors and windows. Make your home look “lived in.” Have a friend park in your driveway from time to time and collect your mail or packages. Alternatively, contact the post office for a hold on mail. Use timers to turn lights off and on automatically. Protect your location on social media sites. Thieves can target your residence if they know you are out of town. Take valuables with you or lock them up. Never leave your keys, ID or laptop. Depending on the weather, arrange to have snow shoveled while you are gone. Do not pack belongings in your car in advance. Pack and leave on the same day. Have a fully charged cellphone on hand, as well as blankets, water and snacks. Make sure your gas tank is half full at a minimum. Contact individuals at your destination and let them know when you are leaving and when you expect to arrive. If your car breaks down, stay with the car and do not accept rides. If someone stops to help, ask them to call the police. Use your own cell phone if possible. Have an emergency road kit or make one of your own. Have something to eat before consuming alcoholic beverages. Food high in protein will stay in your stomach longer and slow the absorption of alcohol into your system. Know your limits. Only time will eliminate the alcohol from your body. Establish a designated driver or use a ride-sharing app to get home safely. Never drink and drive. Before the old year passes, make sure to download the LiveSafe app and report anything suspicious to University of Kentucky Police Department. May these tips help you hail the New Year, heedless of wind and weather by sharing the responsibility of safety together.